The World Bank just released a drylands research study on Friday June 1 and one of the most exciting findings was the positive correlation between tree density and resilience to drought. “Crop modeling carried out for this study helped provide orders of magnitude of the benefits of FMNR in terms of reduction of drought impacts. When FMNR of native species is added to the other productivity-enhancing technologies discussed in this book, the effects are impressive. In a group of 10 countries in East and West Africa, the projected number of poor, drought-affected people living in drylands in 2030 fell—compared to the Business As Usual scenario—by 13 percent with low density tree systems and by more than 50 percent with high-density [10 trees/ha] tree systems”. (p73 – table below). The ramifications are significant for how we think about FMNR and disaster risk reduction. Using FMNR to increase tree density in these dryland countries could reduce the number of people impacted by drought by 50% by 2030. 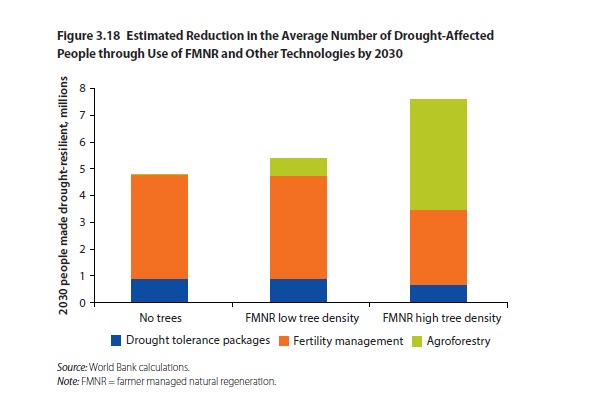 To put this in perspective in the Republic of the Niger, farmers practicing FMNR have an average of 40 trees per hectare, which according to this study would give farmers even greater resilience to shocks. We know from Niger that wide scale land restoration using FMNR is possible: as of 2016 there have been some 240 million trees regenerated across six million hectares. This report gives even more rationale to suggest widescale restoration through FMNR could, and should, be replicated in other dryland contexts in Africa. Indeed, the Africa Union’s 2nd African Drylands Week held in Ndjamena (August, 2014) called for massive scale up of FMNR in the conference declaration: “(We) recommend and propose that the drylands development community, through the African Union, and all collaborating and supporting organizations, commit seriously to achieving the goal of enabling every farm family and every village across the drylands of Africa to be practicing FMNR and ANR by the year 2025,“. Furthermore, 25 African countries have committed to restoring over 80 million hectares to help reach the target of the AFR100 initiative. This initiative is calling for the restoration of 100 million hectares of degraded land across Africa by 2030.